Let’s play a game. It’s New You against …. Yesterday You. New You and Yesterday You each get 100 marbles to play with. Each marble represents one unit of time, attention, effort, and energy. The object of this game is to come closest to achieving the ambitious, long-term vision that New You and Yesterday You share. The way each invests his 100 marbles will determine his progress towards the vision. Oh, and there’s a catch – this game isn’t fair. Only New You is allowed to invest his marbles in any way he wishes. Yesterday You, on the other hand, must stick with his marbles’ current allocation, forever. And New You is allowed to peek at Yesterday You’s game plan before creating his own. 1. If this game truly existed, and you wanted to win, would you choose to be New You, or Yesterday You? 2. And as New You, how would you allocate your 100 marbles differently than Yesterday You to defeat him? To bury him? After all, this game DOES exist. And you have no choice about whether or not to compete. Get ready, because New You vs. Yesterday You begins tomorrow morning, at the moment you wake up. 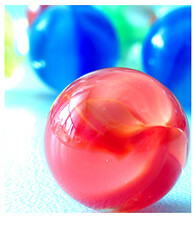 How will you invest New You’s 100 Marbles to win the game? Rob Crawford, a school administrator who loves baseball and acoustic guitars, writes on productivity, impact, and happiness at Crawdaddy Cove.